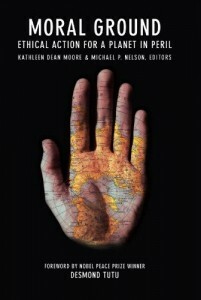 Click on the cover to be taken to the "Aloud" program at the Los Angeles Public Library, where "Moral Ground" editor Kathleen Dean Moore will be part of a panel on western water on June 6, 2012. Spoiler alert. It’s low bad for the monthly Mead report. The largest reservoir in the United States, which serves Southern California, Southern Nevada, Arizona, and Mexico, was at 1,119.38 feet at the close of May, 2012. That’s lower than it’s been for seven months, a mere 44 feet and change above a level that will invoke shortages in Arizona and Nevada. But! Now that doomsayers like me are all cheered up at any opportunity to remind wastrels with lawns, “We told you so,” it emerges that there is a more constructive voice in town. As clarification, it merits adding that the town is Los Angeles and the voice is that of philosopher Kathleen Dean Moore. In order to embrace conservation, we have to first decide, in Moore’s words, that “it’s wrong to wreck the world.” Anyone interested in conservation should be at the Los Angeles Public Library on June 6th at 7pm. For details click here. Me too. Hope to see you there.